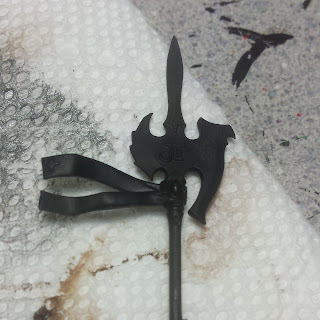 Since this is a quick one, I just used an old High Elf halberd I had laying around. I chose Spiritstone Red as the example color, because I like it the most and I think it shows the effect best. The gemstone paint is kind of like a gloss varnish with color added into it.  It doesn't like being thinned, so be careful how much water is on the paint bristles. 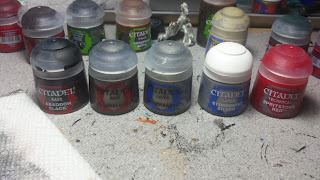 The same goes for Citadel's metallics, they can be really picky about how thin they can go while still holding together. Out of all of my paints, these are the only ones I usually use straight from the pot. 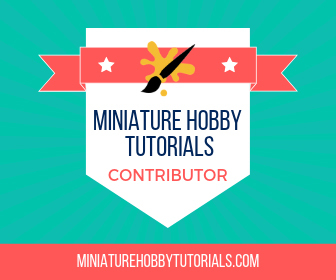 If you plan on matte varnishing the model after the gemstone paint is on, it will dull the finish of the gems, requiring a reapplication of gloss varnish to each gem in order to make them shiny again. 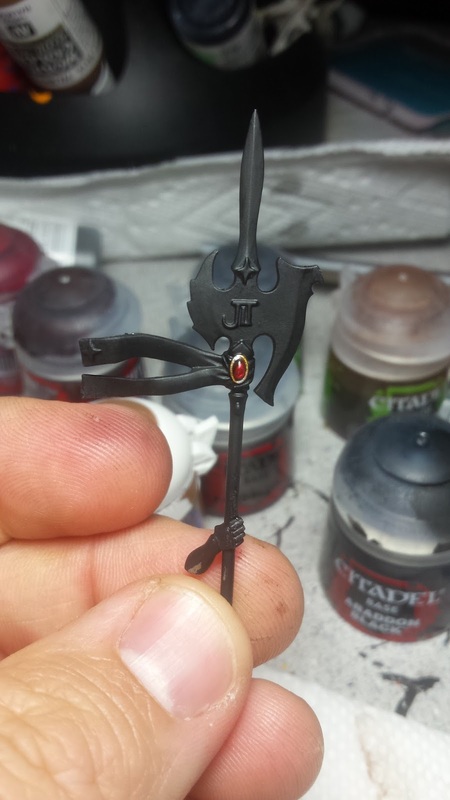 After the primer coat, the first step is to apply an even coat of black on the gem area. For this tutorial I stuck with all Game Workshop colors and went with Abaddon Black for the base coat. The next step is to paint Leadbelcher on the bottom 2/3s of the gem, angled slightly into the northeast edge of the gem. 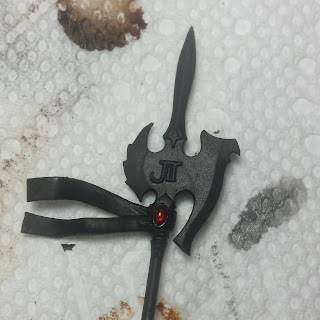 Also, keep the metallic paint from going all the way down to the edge of the gem holder. We want a black "outline" around the base of the gem's sides. 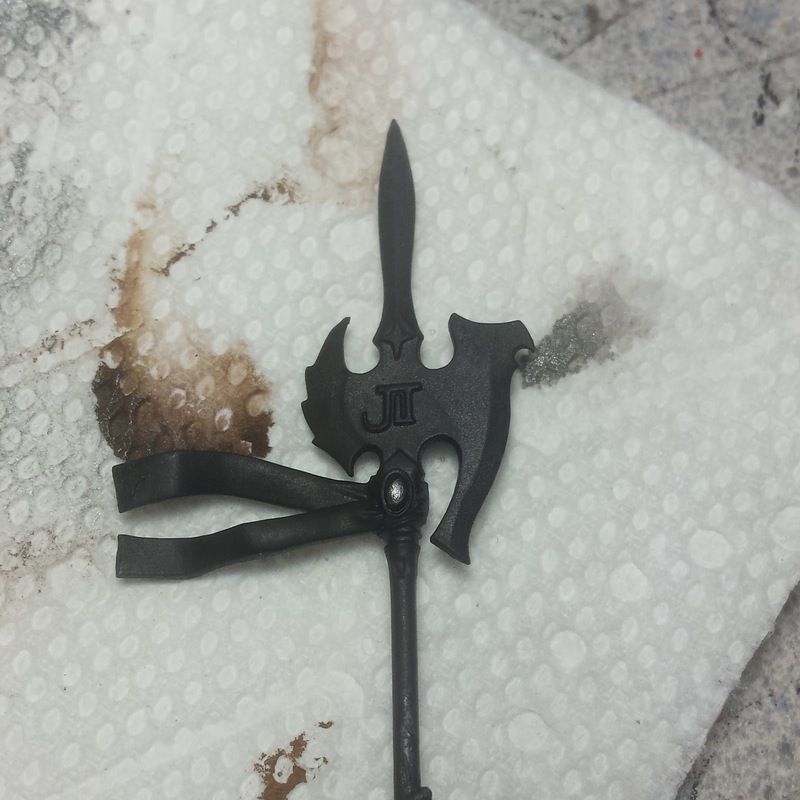 Next up, we paint the lower half of the Leadbelcher with Ironbreaker, you can also leave a small line of Leadbelcher showing along the edge of the black, if you like. The last silver step is a dot of Stormhost silver in the middle of the Ironbreaker section. If you feel the Stormhost looks to dim, feel free to hit it again once it's dry. Finally, we paint on the Gemstone paint. For this one, I needed to paint it on twice in order to get the coverage that I liked. But I also think I had a bit too much water on my brush during the first coat and that may have affected it a little. After a quick touch of gold around the edge trimming, it looks all nice and pretty. Until next time! Til then you can catch me on Twitter and Instagram @ryglore. Thanks for reading! Oh ya, and you don't have to spend time blending or figuring out that "just right" mix of shades to made the gem pop properly. Looks awesome. Don't know when I'll have a chance to use them (not too many gems on my space marines!). 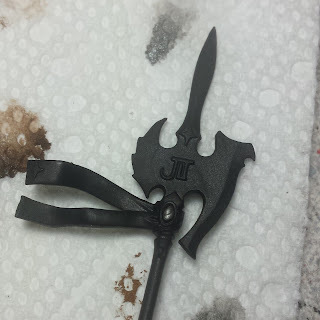 I totally agree about the metallic paints, I don't even bother trying to thin down leadbelcher. Thanks! Found myself using them more on the commission I'm working on right now. 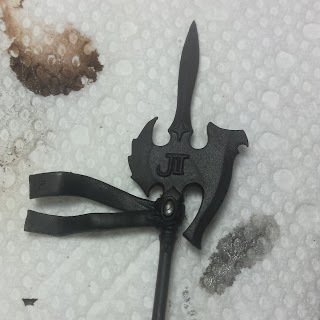 They do save a bit of time, even with the multiple silvers being painted. And i don't need to worry about picking just the right sets of colors.